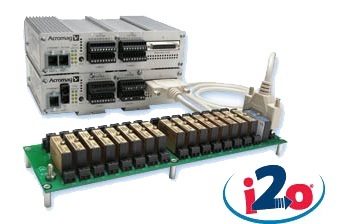 These EtherStax I/O units provide a rugged, highdensity, and high-speed solution to interface a large quantity of analog input signals. Units accept 16 single-ended analog voltage inputs and 16 single-ended current inputs. A DB25 port supports an alternate interface of voltage inputs from 8B signal conditioning modules. This combination of high-density analog current and voltage inputs is ideal for many sensor interface applications in remote zones. 16 single-ended analog voltage inputs and 16 single-ended analog current inputs. ±5V, ±10V, ±20mA, 0-20mA, or 4-20mA DC. 16-bit maximum, 0.00166% (1 part in 60,000). Current Input: Better than 0.1% of range. Voltage Input: Better than 0.05% of range. update/group (5mS for all 32 channels) with averaging, loopback, and totalization functions disabled. CMR (50-60Hz): Better than -72dB. 0-500 samples. One register for all channels. Failsafe or non-failsafe (user-configurable) relay trips on power or link-loss failure. Dual-port Ethernet switch. User-configurable as a true switch (default mode) or low-latency hub. One multi-mode with SC connector. 2km communication distance. Full/half-duplex, selectable. Modbus TCP/IP, UDP/IP, i2o peer-to-peer. Compatible with STP, RSTP, or any ring scheme. Operating: -40 to 70°C (-40 to 158°F). Storage: -40 to 85°C (-40 to 185°F). 4.8W (copper ports), 5.8W (fiber-optic ports). Continuous: 250V AC, 354V DC (150V AC ch-ch).